The recent gain of territory in Iraq by ISIL, the self-proclaimed Islamic State also known as ISIS or DAASH, begs the question of who is behind this al-Qaeda alumnus. Pundits are quick to accuse Saudi Arabia, but other informed sources point to Qatar and Turkey as the central culprits behind the violent non-state Takfiri terrorist actor. Still others claim that ISIL is a U.S.-U.K. trained, CIA- Mossad proxy force led by a Jewish operative. ISIL has its origins in a Kurdish insurgent group formed after the 2003 U.S. invasion of Iraq and was headed by arch terrorist Abu Mus'ab al-Zarqawi, who swore allegiance to al-Qaeda in 2004 and formed al-Qaeda in Iraq (AQI). After al-Zarqawi's death in a U.S. air raid in 2006, the surge in 2007 and the program of bribing Sunni tribesmen to renounce resistance to the American occupation, AQI experienced a period of decline, before rebounding after Western regime change operation began in Syria in 2011. That was when leader Abu Bakr al-Baghdadi was dispatching fighters for the al-Nusra Front, and renamed his Iraqi contingent the Islamic State of Iraq and the Levant (ISIL). During his tenure as head of Saudi intelligence from July 20, 2012 until his departure on April 15, 2014, Saudi Prince Bandar bin Sultan was heavily involved with arming Takfiri terrorists in Syria and Iraq. An ambassador to the U.S. for 22 years, Bandar has freely employed terrorists in pursuit of U.S. and Saudi policy objectives, even obliquely threatening Russian President Putin that extremists under Saudi control might disrupt the Sochi Winter Olympics. "I can guarantee protection for the Winter Olympics in Sochi on the Black Sea next year," Bandar reportedly told Putin in a July 2013 meeting. Qatar has been the chief logistical supplier to Takfiri extremists attempting to overthrow the government of President Bashar al-Assad. As of 2013, according to The New York Times, Qatar had supplied insurgents with some 85 planeloads of weapons and material, compared to 37 for Saudi Arabia and lesser amounts for other actors like Jordan. While not as big a financial supporter as Qatar, Turkey nevertheless serves as the primary logistical base through which most munitions, material and manpower are funneled to foreign-backed militants in Syria. At an August 2009 press conference with Turkish Prime Minister Recep Tayyip Erdogan and President Abdullah Gul, Qatar ruler Sheikh Hamad bin Khalifa al-Thani expressed his desire to build a pipeline through Syria to Turkey for exporting his country's vast liquid natural gas reserves. "We are eager to have a gas pipeline from Qatar to Turkey," he exclaimed, and in pursuit of that goal, almost the moment Libya's Muammar al-Qaddafi had been killed in October 2011, Qatar began aiding the foreign insurgency in Syria. Qatar had just finished playing a key role in toppling the Libyan regime by supplying rebels with weapons, supplies and training. In January 2012 on the CBS news program 60 Minutes, Sheikh al-Thani publicly announced his desire to topple the Syrian government, declaring, "For such a situation to stop the killing ... some troops should go to stop the killing." Then in February, Qatar Prime Minister Hamad bin Jassim al-Thani affirmed, "We should do whatever is necessary to help [the Syrian opposition], including giving them weapons to defend themselves." To that end and at the request of Saudi Deputy Foreign Minister Prince Abdulaziz bin Abdullah al-Saud, a military command and control center was established in the Turkish city of Adana, which is home to the U.S. Incirlik Air Base, a convenient location for forwarding "nonlethal" aid from Washington. Naming three Kuwaitis prime fundraisers for ISIL, U.S. Treasury Undersecretary David Cohen said, "Through fundraising appeals on social media and the use of financial networks, Shafi Al Ajmi, Hajaj Al Ajmi, and Al Anizi have been funding the terrorists fighting in Syria and Iraq." In addition to funds funneled through Kuwait, ISIL appears to be developing its own financial sector. Paul Sullivan, a Middle East specialist at Georgetown University in Washington, said, "ISIL is developing in a vital oil, gas and trade area of the world." Previously, ISIL gained control of the former Conoco gas field at Deir al-Zor in Syria, and, according reliable estimates, was netting about $8 million a month even before its recent territorial gains in Iraq. The U.S. sees itself and its allies as locked in an epic struggle against adversaries bent on forming a unified Islamic world to supplant Western dominance. Of course, ISIL plays a leading role as current villain in this continuing drama, which bears an uncanny resemblance to a U.S. Army mission trajectory called "Expanding Scope," which is discussed in a 2008 report entitled Unfolding the Future of the Long War by the Rand Corporation. "A powerful Sunni Islamic state may prove even more troublesome than Iran," the authors of the report caution, "especially in its support for SJ [Salafi-Jihadism]." Yet despite the warning, the U.S. and its Western allies have repeatedly armed and trained extremists to destabilize governments targeted for regime change, among them Syria, Lebanon, Libya, Somalia, Sudan and Iran. Concurrent with the irrational policies of his Western masters, the former Emir of Qatar expressed his belief that extremists could be transformed into political participants if promises of democracy and justice can be fulfilled. "I believe you will see this extremism infuse into civilian life and civil society," he insisted in an Al-Jazeera interview on September 7, 2011. But instead of transforming terrorists into political participants, the U.S., along with its Saudi, Qatari, Turkish and Western allies, has created a monster that is out of control and with upwards of 50,000 fighters controlling an area the size of Belgium. "What began in Syria during the spring of 2011 as a simple uprising by a few so-called rebels has blossomed into a brazen and bloody movement led by the Salafi cabal and housed in Saudi Arabia, Qatar, and Turkey, to topple not just the Syrian regime, but also Iraq and Lebanon," lamented journalist Agha Shaukat Jafri. Indeed, ISIL poses not only an immediate threat to Syria, Lebanon, Iraq and Turkey, its rapid emergence as a regional actor jeopardizes Saudi interests, which suggest that rapprochement with Tehran would be wise. Yet Riyadh continues to issue Iran-phobic rhetoric. "There is no confidence that the Obama Administration will do the right thing with Iran," Prince Alwaleed bin Talal confided. "We're really concerned - Israel, Saudi Arabia, the Middle East countries - about this," implying the existence of a de-facto alliance among the Zionist regime, Saudi Arabia, Qatar, Turkey and Kuwait, and possibly other regional actors. ISIL may in fact be a CIA-Mossad proxy force. U.S. Senator John McCain has been photographed with ISIL leader Abu Bakr al-Baghdadi. 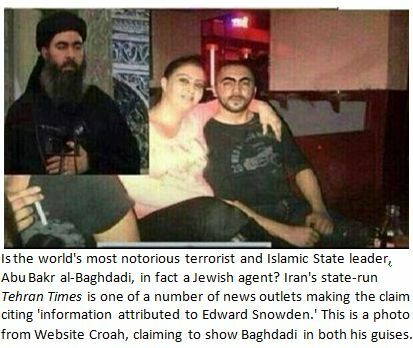 According to sources traceable to Edward Snowden and as uncovered by Iranian intelligence services, al-Baghdadi is really Simon Elliot, a Jewish agent for Zionist intelligence agency the Mossad. 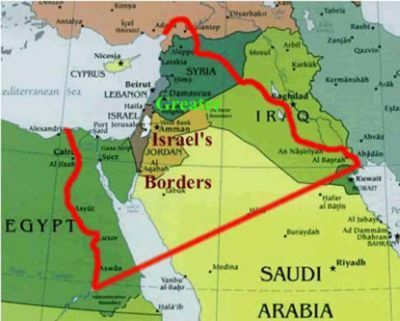 The plan was to invade countries which constitute a threat to the Israeli entity in order to establish the biblical "Greater Israel." In any event, AKP Deputy Chairman Mehmet Ali Sahin is correct when he says bombing will not fix the mess the U.S. and its misguided allies have created. To eradicate the malignancy of Takfiri terrorism in the Middle East, the U.S. must first cut its support for the Zionist regime, renounce regime change in Syria, and align itself with the only regional power that can help, namely Iran.